Modern metal fencing was treated to a colourful make-over as Legsby residents took part in a “yarn bombing” event. 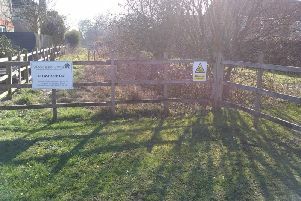 Target of the woolly work was the fence surrounding the old school, next to the village church. The village is currently working with the Diocese of Lincoln to negotiate a lease to use the building as a community meeting place. “It is taking a long time to get the lease and we didn’t want to lose momentum,” said Janis Bowley, one of the yarn bomb organisers. “The project has been all about getting all ages involved. The old school has been used as a polling station, meeting place and youth club since it ceased to be a full-time school. But over the last few decades it has become unloved and uncared for. It was more than two years ago the Legsby Old School committee formed to create something the whole community can use. “Somebody should be doing something to the building – the longer it is left, the worse it will get,” said Janis. A spokesman for the Diocese of Lincoln confirmed negotiations were ongoing. “The diocese is continuing to work through a complex process with regard to the building, and further information may be made available in due course,” said the Rev Adrian Smith.